Héctor García and Francesc Miralles. Ikigai: The Japanese Secret to a Long and Happy Life. Translated by Heather Cleary. New York: Penguin, 2016. 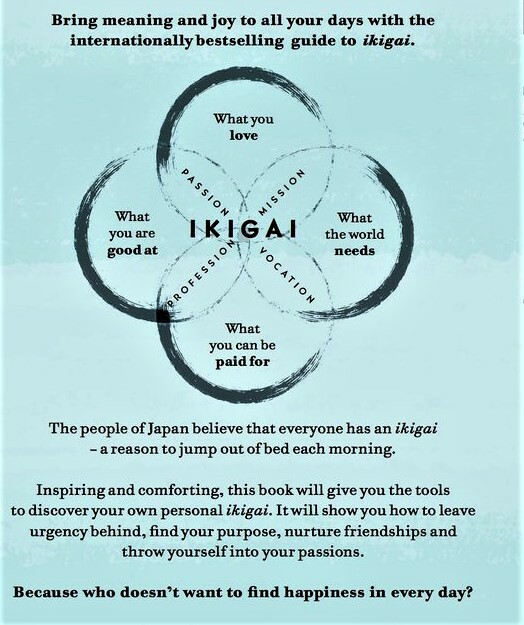 Originally published as Ikigai: Los secretos de Japón para una vida larga y feliz (Medicinas complementarias). Urano, 2016. Part the Second. Next we turn to Viktor Frankl (1905-1997), survivor of the Holocaust, psychologist, and interesting thinker. Frankl, whose wife, mother and brother all died in Nazi death camps, asks via his logotherapy approach, "Why do you not commit suicide?" (page ). If you can answer that to your own satisfaction, you probably have found a reason or reasons to want to live, even in a foul world. Frankl employs a great deal of existentialism to his method of psychology. He "believed that our health depends on that natural tension that comes from comparing what we've accomplished so far with what we'd like to achieve in the future . . . a challenge we can strive to meet by applying all the skills at our disposal." (page 40). 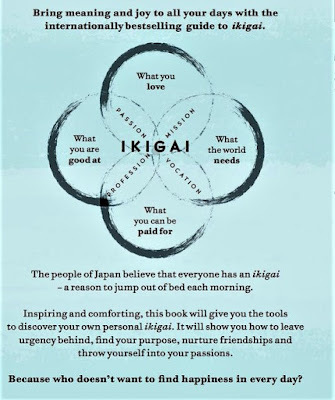 Purpose = Ikigai, "reason for getting out of bed." (page 41). The authors then delve into the Zen Buddhist psychotherapeutic methods of Shoma Morita (1874-1938). Morita's approach is holistic. He has his charges spending time with themselves, and then doing. "[T]heir feelings will change as a result of their actions." (page 46). "Discover your life's purpose. We can't control our emotions, but we can take charge of our actions every day." (page 48). There's a lot more to explore about Morita therapy, but let's just say that poets and philosophers would dig it, after an initial rebellion. I do not know the author, let alone the book, but I can say that it is encouraging to have reason to get up in the morning. The person who has no goals, lives without knowing why he is living, and so he spends time questioning life. Do not do this! Just live! I've got some of his books but have never read more than a sampling or two.